Strange book, strange ending. I actually said this out loud right after I finished The Pickup. I wanted to read some of Nadine Gordimer's fiction for quite a while. I love her essays (as you can see for yourself here and here), I respect and admire her writing style. What convinced me, though, was Gordimer's claim that her novels contain more truth than her non-fiction. A proud claim, almost a dare. I just couldn't resist. The Pickup didn't shatter my world. It did not provide a life changing revelation, it didn't even make it to my list of the best books of all times. I doubt if a year from now I'll be able to recall any details. Still - it is a damn good book. Definitely not fluff. A well-connected South African girl meets a guy, an illegal immigrant who soon is on his way to deportation. In a rather dramatic twist, she decides to follow him to his homeland, a desert village in an unnamed Islamic country. A clash of cultures provides background to musings on life, love, values, society and the usual 'what it's all about' questions. Read the book if you want to find out how the story ends. The tale would do with a more clearly defined ending, but somehow one feels that here the story is not so important. I'm convinced the plot is just an excuse to philosophy - and I take my hat off to Gordimer for precisely this reason. Stories, I think, tend to be banal, questions about the human condition are universal. 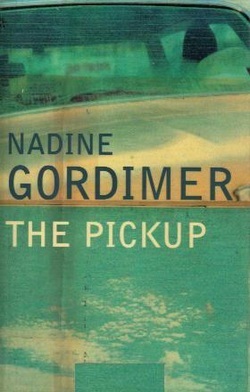 The Pickup is a language feast, but I've learnt to expect this when reaching for any Gordimer's book. Kind of poetic, but not quite, with a note of melancholy and metaphysical heaviness but without pseudo-scholar linguistic parades. Just the right balance between descriptions, action and the inner workings of characters' minds. Still, there's one thing that stands out even more. I've read quite a few books about the Arab culture written by Westerners, Western women in particular. They all read like horror stories - traumas, slavery, lack of freedom, male dictatorship, you know the drill. The Pickup is the very first instance where being a Western woman married to a Muslim is not presented as a nightmare. More, in an astonishing role reversal, it is the Islamic male that feels trapped and unhappy within his culture, while the Western woman fits right in. I was halfway through the book before I realised this, but to me, it is the most profound contribution that this piece of writing brings. If we want to do away with the demons of the East-West conflicted culture clash, we could start with producing more books like this one. One more thing - a review on the cover claims that The Pickup is a modern Romeo and Juliet story. This is the ultimate proof that being a reviewer for The Times doesn't mean you're always right.